Harvard Business School Professor and leading management thinker, Michael E. Porter addressed a gathering of industry leaders on the subject of “strategy” and “shared value”. 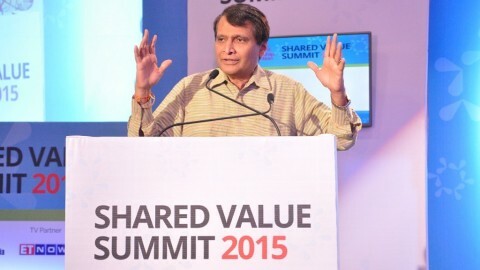 He was speaking at the Porter Prize held in Taj Mahal Palace, Mumbai by Institute for Competitiveness. Michael E. Porter shared his ideas on the field of strategy and shared value at the Porter Prize, which is annually organised to recognise the strategic acumen of corporates in India. 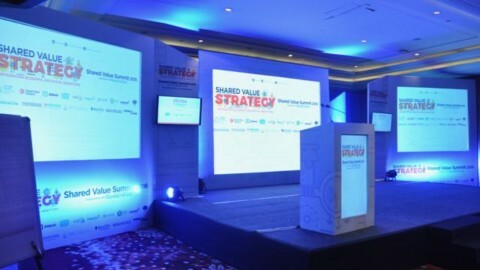 It was attended by CXOs, top industry leaders, thinkers, and senior executives from corporates, government and media. Professor Porter discussed what constitutes a good strategy and advised the gathering of industry leaders on how to undertake strategic planning for their organisations. He also warned the audience about the common mistakes that companies make in framing strategy. Further, he appealed business leaders to rethink the role their business plays in society. He outlined how addressing societal needs present a huge business opportunity for Indian companies since they have the potential to scale massively. Michael E. Porter is the Bishop William Lawrence University Professor at Harvard Business School and is the leading figure in the field of strategy and competitiveness. Michael Porter delivered two keynotes on strategy and shared value. With regards to strategy, he pointed out that while working with numerous companies around the world, he has come to realise that even though every company knows what strategy is, there is still a lot of learning needed. He began by defining what success means for companies. The usual mistake that companies make is by believing that success is being the “best” in the industry. However, strategy is about being unique. Strategy is a set of long term choices that companies make to distinguish themselves from competitors. He went on to point out the three biggest mistakes that companies make in using the term strategy: confusing strategy and goals; confusing strategy with the steps involved in executing strategy; and confusing strategy with mission/vision. For instance, companies tend to focus on pleasing the stock market than focusing on performance. On the contrary, there is a need to understand that performance drives stock markets and not the other way around. Further, he discussed what determines business performance. According to him, there are two drivers: structure of the industry as a whole and the relative position the business occupies within the industry. Together these factors determine profitability of businesses. He substantiated these learnings by sharing the cases of a few industries in the US. He also shared his thoughts on strategies to achieve superior profitability. The key lies in choosing the path of differentiating products from competitors or competing on cost by bringing in efficiency. Further, he outlined the strategies to achieve competitive advantage by leveraging on the value chain. He warned the industry leaders in the room to not confuse operational effectiveness with strategic positioning. Operational effectiveness is about doing same things better than your rivals. Strategy is about doing things differently. A big mistake that companies make is by focusing on the former and believing it to be the latter. Professor Porter, then, described tests to identify a successful strategy. These include: creating a unique value proposition; a distinctive value chain; making clear trade-offs; integrating choices across the parts of the value chain; and ensuring continuity of strategic direction. The essence of strategy is making choices, including choosing what not to do. The keynote ended with a discussion between Professor Porter and Sanjeev Puri (CEO, ITC) on strategy and competition in the Indian context. In the second keynote on shared value, Michael Porter discussed the need for businesses to play a larger role in society, especially in a country like India. Societies are facing multiple challenges, but government and NGOs lack sufficient resources to fully meet them. Businesses are the only institution that can create wealth and prosperity and are unique in their capability to scale their operations. Professor Porter called out to the industry leaders gathered in the room to rethink their businesses and think differently. Initially, the role of business in society was in the form of philanthropy. Over time corporates found a better way to do that through corporate social responsibility programmes. However, the idea of CSR has become more about compliance to ethics and laws. It has done some good to society but it is not enough to deal with social problems that exist on a vast scale. If businesses want to create fundamental changes in society, it needs to adopt the idea of shared value, which involves addressing societal needs and challenges through the business itself while making a profit. He exemplified the idea by describing Nestle’s impact on milk farming communities in India, who are suppliers for the company. 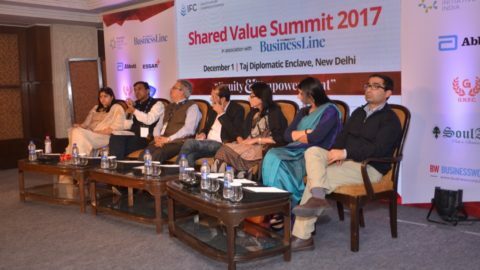 Shared value is different from CSR in a sense the latter is an added cost on the company while the former gives economic returns. Professor Porter further explained how shared value is beneficial for both the society and business itself. For instance, reducing environmental impact of businesses can make them more efficient. He ended with instances of Indian corporations that are making economic gains while creating societal impact. He stressed on the point that shared value is not charity, but a new of thinking about business. He ended by appealing the country to move beyond the 2% CSR law and progress towards the idea of shared value.